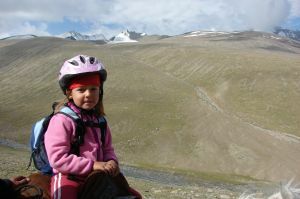 After a five year leave from the high mountains due to our small child, we were eager to see some higher mountain again this year. It would have been a too comfortable solution to let Nina stay at some relatives' in Germany and have a nice trip without her. 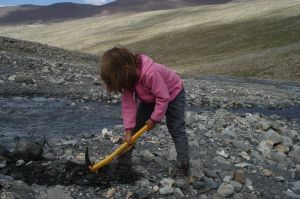 Of course, the good solution would be a destination which is somewhat suited for a five-year old child as well as for mountaineers. 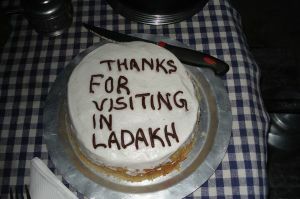 At the end, our choice was Ladakh. 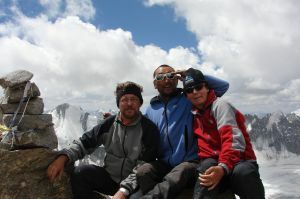 There are quite some 6000 m peaks which can be reached without a big effort. 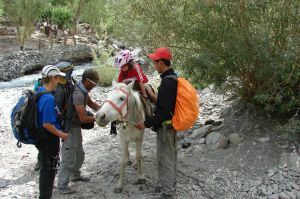 During trekking routes, the baggage is usually transported by horses or donkeys - it should not be too difficult to organise a riding animal for Nina. Details about the organisation are described on the practical hints page. Depart from Munich at 12:20; after a seven hour flight we arrive in Delhi at 23:00, including +3:30 time zone change. It takes a little until the baggage appears, but the immingration and customs control is quite speedy. At the exit of the airport we are received by the local staff of Gesar Travel. They bring us to Terminal 1 which is a few kilometers away (but along the same runways as the international airport). Fortunately with air condition - as we leave the airport building we feel like in a washhouse. 100% humidity at about 30 degrees centigrade - in Delhi the monsoon is ruling the weather. At half past one in the morning we check in for the domestic flight to Leh, and until half past four we try to catch a little bit of sleep on the chairs in the departure area. The "Silent Airport" as announced is apparently not valid at night: noise by construction works during all the time. At 4 am the traders come and open their stores. By chance we see that our fligh begins boarding 10 minutes before the planned time - silent airport means, of course, no announcements for departures. In the aircraft we find a dense fog which apparently is caused by the air condition trying to climatize the interior while the outside climate is so extremely humid. Departure on time at 5:15; clouds above tha plains, also the mountains are more or less obscured by clouds, so we cannot recognize any landmarks. 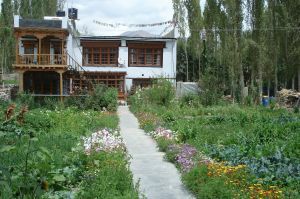 Leh 6:15, Daniela (Gesar Travel) welcomes us at the airport and brings us to Yartsa Guesthouse. After a good breakfast we sleep a few hours, we had not a lot of sleep within the last 21 hours. 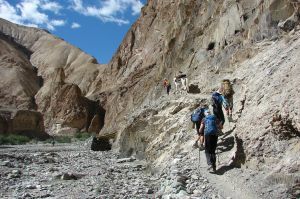 At 3500 m altitude we start all our activities at a low pace: in the afternoon a short reconnaissance of the city center of Leh, half a kilometer from the guesthouse. The weather is rather cloudy with a bit of sunsine, that makes it not too hot (about 25°C). After breakfast, we visit the office of the agency and clarify our meal preferences for the trek and other details. 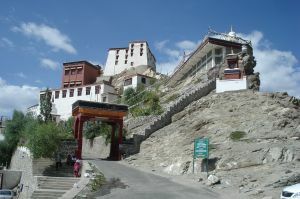 After that, our Guide Rigzin (who will also accompany us on the trek) shows the places of touristic interest like market, Old Leh, Palace (currently with exhibithian "Czech Castles"). After lunch, we visit the monasteries Maitreya Gompa and Palden Chamo Gonkhang above the palace; short walk down to Shankar Gompa (Nina stays in the car instead of the walk). 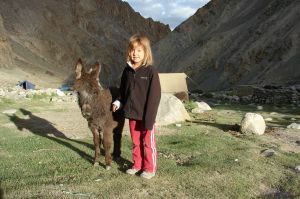 After having vistied the donkey refuge, it is time for dinner in one of the restaurants in Leh. Didn't sleep too well - the street dogs had their nightly controversy very close to our guesthouse. 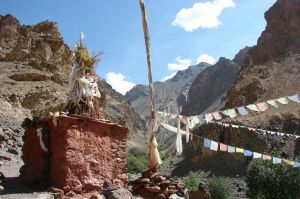 In the morning we visit the nunnery Nyarma and the big monastery Thikse. First rather modest, the latter quite extensively restored. 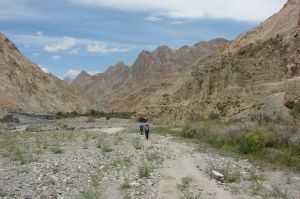 A short hike leads us along the old road through the irrigated plains of Indus River. Unlike the barren mountain slopes, here everything is green. At a very deep puddle that covers all the road, the inhabitants who are busy washing their car bring us to the other side with this car. 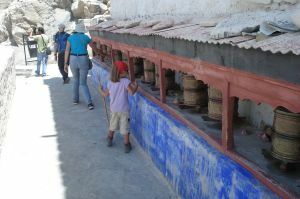 After an hour we arrive at Shey Palace which is currently being restored: The stupa is painted by splashing white color onto it from beneath. 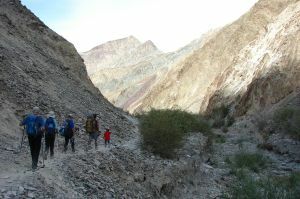 In the morning, Marion, Nina and Hartmut hike through Gyamsa Valley above Leh with Rigzin. Claudia and Henning care about their digestion, staying in the guesthouse. Better they have a rest now and cure well than making an unplanned rest day necessary on the trek. 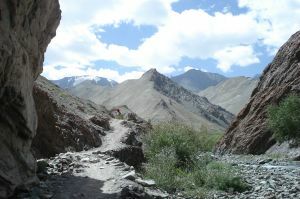 We walk on a dirt road from 3670 m altitude towards the small ab Gyamsa Valley. At a meditation place we have a break at a nice meadow where cows and donkeys are grazing. 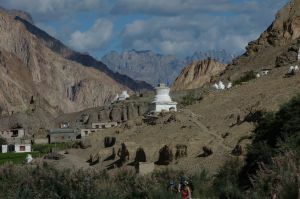 The trail ends at a large fenced estate in the end of the valley with several stupas. Surprisingly, we are asked to enter the estate and invited by the owner (a retired army officer) to a tea and an interesting conversation. Away back to the guesthouse by car. In the evening we meet our Überlingen Alpine Club colleagues Britta, Helmut and Lena Norwat, who just have crossed Markha Valley in the opposite direction. 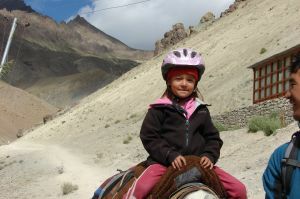 They tell us about their experiences in Ladakh. First trekking day. 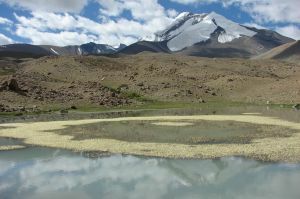 In the morning we cross the Indus by car and are brought to to Jingchen (3400 m), the end of the street in the Rumbak Valley. There, horses and donkeys are waiting in order to be loaded with our baggage. Nina gets a white horse for riding. 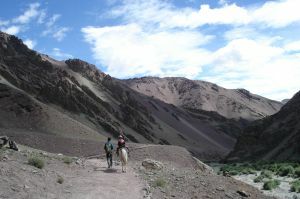 Together with Rigzin and the helper acting as horse drover we go up the valley. Nina is a little self-conscious at the beginning. After half an hour she is sitting sovereignly on her horse, as if she would never have done anything different than horses riding. Considering her previous experience of three times one hour on a pony, that is a very considerable progress. 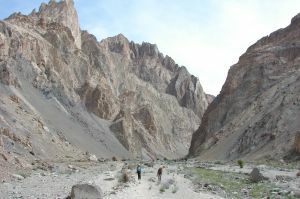 The way leads through impressive gorges. Along the creek, grass and trees are growing, anything else is completely meagre. 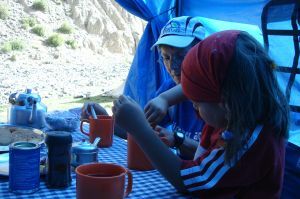 At Rumbak we have a lunch break in the tea tent; there one can buy alomost any conceivable beverage. 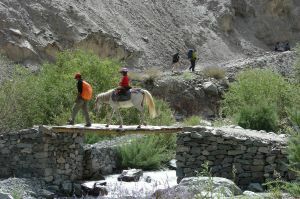 Meanwhile the packhorses overtook us, they are already on the way to the camp. 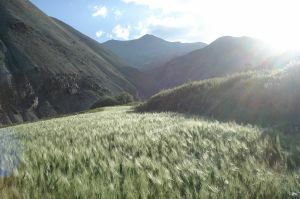 One hour above Rumbak, we reach our campsite Yurutse at 4110 m, a nice small meadow. Obviously Nina felt well during the three hours on the horse. 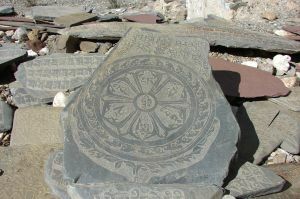 In the afternoon we do a small walking excursion to the place of Yurutse (4170), which consists of only one house. But that resembles more a castle than a farmhouse. Around this place, there are some fields where barley is grown - green islands in a world of rocks and scree. Nina is running around as if there were no altitude, Apparently she had not enough exercise during the day. At half past six we get morning tea, but we all are awake already - the camp is already in the sun. 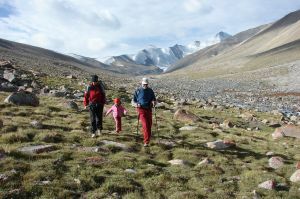 Around eight, we start our march; for the first hundred meters of altitude Nina also joins us walking. 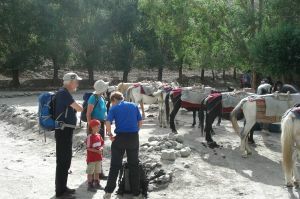 Meanwhile the staff dismantle the camp and prepare the horses. 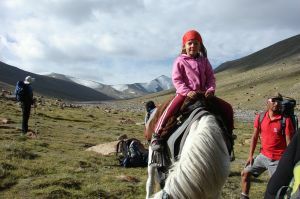 Ninas riding horse then comes after half an hour, following the wider path. Yesterday we had tried to keep pace with the horse, today we have learned a bit: Horse and helper are well accliatized, but we are not. So, Nina can ride ahead and wait for us when they'd find a nice place for a break. This works better. Nina has no problem leaving us and going ahead (with a person speaking a language she doesn't understand) for an hour or so. 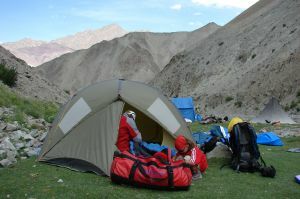 At 4360 m we have a rest at the last tea tent before the pass; then we continue upwards towards Ganda La (4978 m). 3 1/2 hours from the camp to the pass. 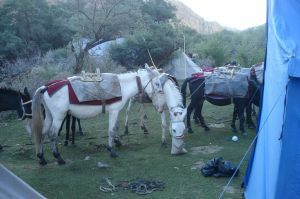 The horses with the equipment pass by shortly before the pass and continue to the intended campground. The descent is a little too steep for riding - Rigzin is carrying Nina on his back (we brought our child carrier backpack from Germany) and goes down to Shingo Valley with Henning. Marion, Claudia and I have a look at the mountain above the pass. 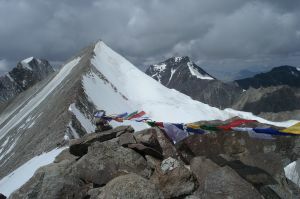 After an hour, Ganda Ri (5199 m) is reached. 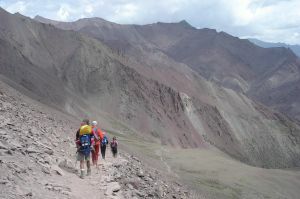 Nice panorama, views to Stok Kangri and many summits and valley unknown to us. The descent from the pass is warm and sandy. We meet the others in the tea tent above Shingo, coming in time for a (late) lunch. 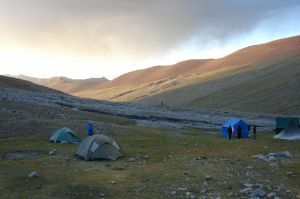 Half an hour further down, our tents are already pitched at the campsite at 4050 m.
Here we don't need the toilet tent, there is a fixed toilet (not an advantage regarding cleanliness, compared to the toilet tent). The tea tent at the campground is open only for a short time. 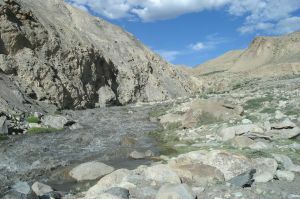 A small creek (an irrigation channel which is branched off the river) is flowing through the camp. Nina lets "ships" (small pieces of wood) go down and watches how far they come. At the "big" river, we can wash our feet; there Nina is playing "cooking food" for an hour or so. 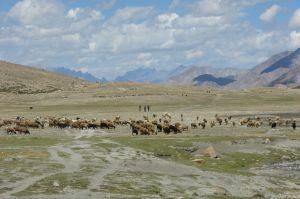 The trail descends towards Skiu, but the valley is lengthy. However the gorges are worth seeing. In the beginning under the trees there is not enough space for riding. Nina leads the way for our small group, singing the whole time until the riding horse is catching up. Then we continue in the proven rhythm of riding ahead and waiting. In Skiu (3365 m) we meet the main valley which we will follow upwards to the east from now on. 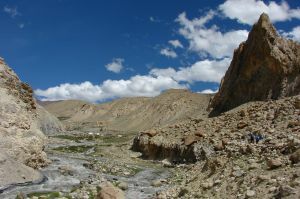 The trail is running rather level at the edge of the green plain of Markha River, with a few ups ands downs. Tea break in Skiu-Khukspa where on of our helpers has his home. Ninas riding horse is eating, attached in front of the house. 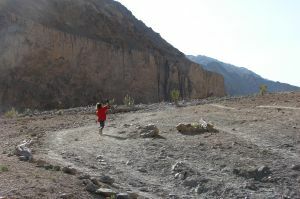 As the caravan with the equipment is passing by, he wants to follow his friends, neighing, trampling and finally jumping over the (fortunately not very stable) wall down onto the trail where he is landing on his back. After the thorns of the hedge are removed from the horse's back, the incident seems forgotten. Anyway it was good that Nina hadn't been sitting on the horse when the horses had met. The further way is often sunny and very sandy, often really dusty. Fortunately later some clouds and a little wind appear making it not too hot. 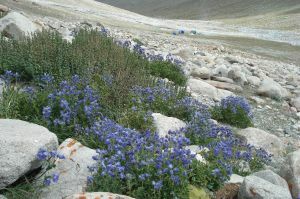 Our campground is Hamourta (3520 m), a nice meadow, again crossed by a small creek. 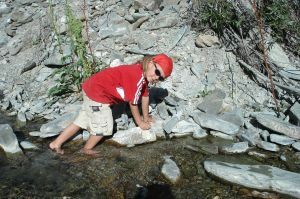 The creek can be inspected thoroughly, correcting the fiver flow here and there together with daddy. Also here we find a tea tent where beverages are available. We continue along the river, very slowly gaining height. 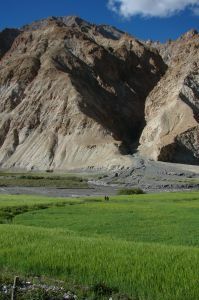 The valley bottom is mostly wide, but often the trail must climb up at the edge where river bends use the whole space. Still, sky-high walls are surrounding the valley at both sides. 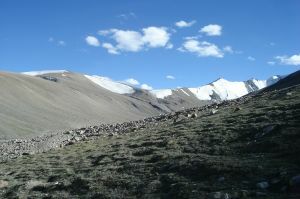 Near Markha, the slopes begin to bend backwards a little, and there are longer secondary valleys. At one of the three river crossings there is no bridge. The sandals which we have with us are a good idea. Fortunately the water is not even knee-deep, and in the sun our feet are dry soon again. On the river bank we get lunch which had been prepared in the camp in the morning and then transported to here in a dabba. This is a bit very much of a luxury, small snack would have been sufficient for us. The whole day is hot and sunny, we are happy about every tree giving a little shadow. 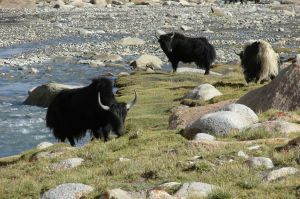 In Markha (3760 m) the campsite is near the river, directly benlow the "village". During the afternoon the clouds are compacting, and a few drops are falling. 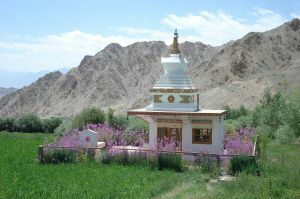 In Markha there is a small monastery which we are visiting. Only one monk holds the fort here, he will be replaced after one year. Our evening shopping takes a little longer. The lady in the tea tent apparently encounters her limits adding the prices of five articles. Meanwhile, Nina is playing card games with Rigzin ("Uno"). The night was cloudy, but in the morning the clouds disappear. Beyond Markha, the valley ground begins wide but soon narrows again. Years ago, apparently the trail used the northern slopes, but it was eroded and is unusable today. We have to cross the river, so we get wet feet again. Shortly after we cross the river again to the north side again, now on a bridge. 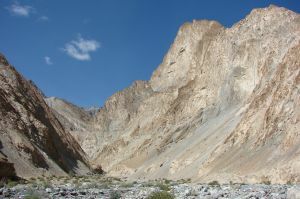 Towards the south, one of the few accessible valleys is branching off, but we still follow the Markha River, although the curved gorge seems like a blind alley at first glance. But that is an illusion, the way goes on indeed. Like in many of the gorges here, showing interesting new perpectives after each bend of the river. 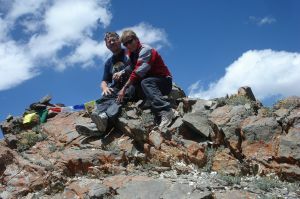 We have a rest at the tea tent of Umlung (3875 m). After that we continue in the heat of the sun, always at the rim of the flat valley ground. 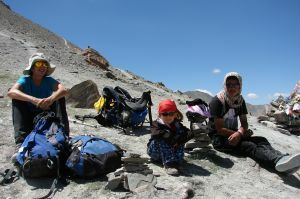 At lunch break in Hankar we finally have reached 4000 meters of altitude. 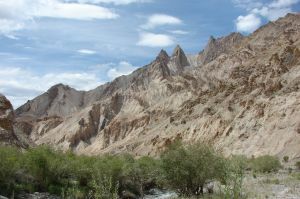 Meanwhile, the background of the valley is dominated by a big glacier mountain, Kang Yatze. The landscape is changing now, we see some less steep mountains (that sometimes even look climbable). 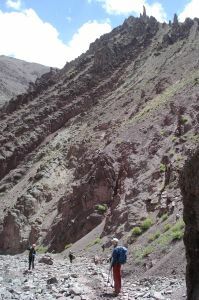 The gradient of our trail is increasing, and after a last narrow gorge the valley opens. 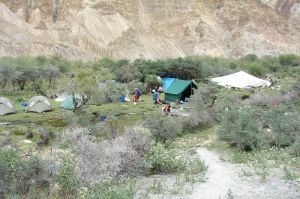 On a meadow at 4250 m, the camp site Tachungtse is situated. In the afternoon the river is swollen and brownish, but at the camp there is clear spring water (and a tea tent). There are also some donkey babies running around, fitting well to Nina's size. Of course, they must be inspected immediately. In the evening some clouds come up, and with the wind it becomes cold quite quickly. After sunset, the sky is clear again. From Tachungtse we walk upwards throuth a stony hill landscape. 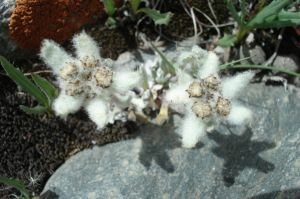 Passing by lots of Edelweiss flowers, after 1 1/2 hours we reach the two small lakes "Tsigu" at 4680 m.
Once again the landscape is changing: A day before we were in a deep canyon with almost no exits, now we are walking through a slightly hilly green highland. 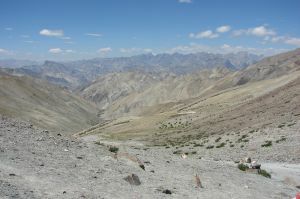 The mountains that were such a high border to the Markha Valley appear merely as a jagged chain along the horizon. 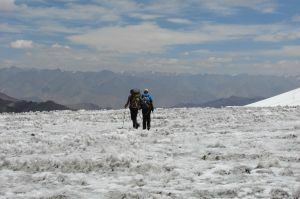 Flat traverse to Nimaling (4850 m) where the last tea tent in Markha Valley is situated. Lunch break, some beverage shopping. 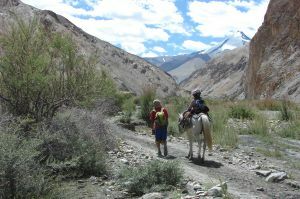 The trek continues from here to Konmaru La ab, but we follow the valley for another 5 kilometers to Dzo Jongo Basecamp at 5100 m. Two tributary creeks make our feet wet, but the shoes dry quickly in the sun. Anyway, we will change from the light hiking boots to mountain boots for the next four days. 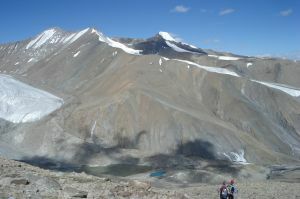 The basecamp is situated in a green high valley, limited to the east by smooth moraine slopes, to the west by moderately steep scree slopes interrupted by small gorges. 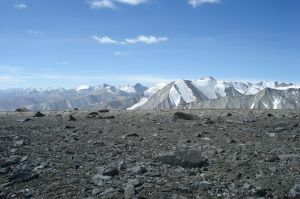 The high peaks in the center of the group are not visible, they are hidden by more or less flat glacier basins. Around 17:30 the sun disappears, it gets cold quickly. Therefore, for diner a suitable wardrobe is obligatory (down jacket). Claudia and I will focus on the rather smooth mountains on the other side of the river. 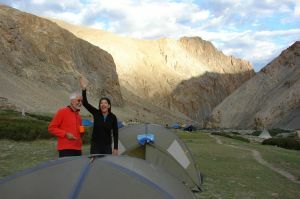 Marion, Henning and Nina spend the morning in basecamp. Depart around six o'clock, it is slightly frosty. Rigzin sticks to our side of the river until after about 45 minutes it can be crossed without slipping from the icy rocks. 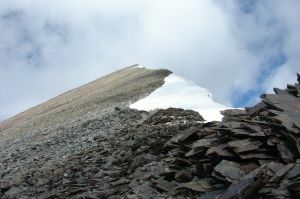 After that, we ascend through uniform scree slopes to a vast saddle 5627 m between Konga Ri and Shaldor Ri. The latter appears a little steep from here, especially not having taken the crampons with us. The detour over the snow-free left ridge looks too far, so we turn left northwards to Konga Ri (5754 m). 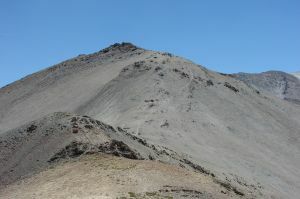 It takes a little time to find the summit - it is a huge debris plateau. 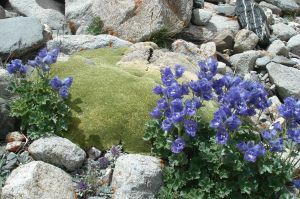 The highest point ist marked by a cairn which is decorated by a few antlers. The view is outstanding, the area Bereich Dzo Jongo - Regoni Mallai Ri - Kang Yatze can be seen well. For the descent, we choose the debris slopes towards basecamp: Because we are still rather early (11 am), the river crossing is no problem. Most of us are not well acclimatized yet, the afternoon program mainly consists of as much of rest as possible (and as allowed by Nina who is calling for entertainment). 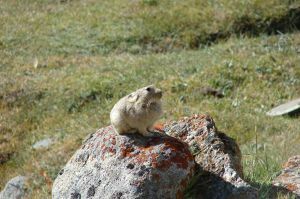 Some animals can be observed: Besides the marmots as in the Alps, there are small pika which quickly run from burrow to burrow, chasing fellows or having a boxing match standing on their hind legs. So there is quite a lot to see. At 5 in the morning, the sky is clear, we (Claudia and Hartmut) are starting in moonshine. 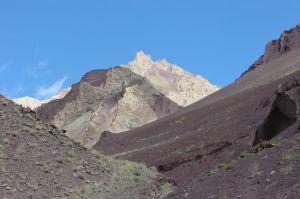 Towards Regoni Mallai Ri, we ascend the moraine slope just west of our basecamp. We proceed quickly, reach 5550 m after 1 1/2 hours. 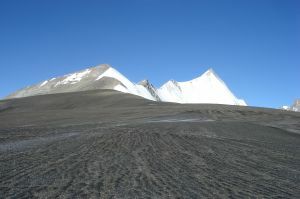 On the almost plain glacier crossing there is hardly any height gain, and the surface is like small penitentes, therefore a little cumbersome. Finally we are facing the summit slopes. 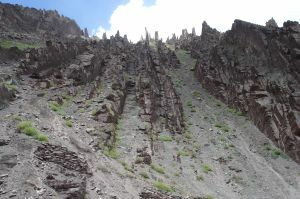 Something like a path is said to exist in the rocky face to the right, but the left ridge appeals more to us. 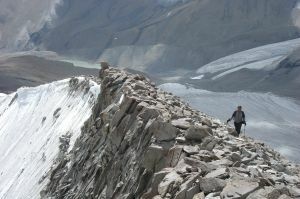 The glacier which gives access to the ridge has some crevasses, causing several detours. 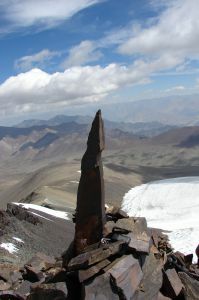 Having reached the rocky crest, we are at 5975 m already. Another 40 minutes to the summit in steep debris with some traces of a path - finally the summit has 6116 m (according to GPS) instead of 6050 given by the map. 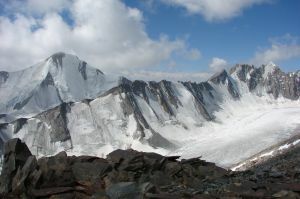 A great panorama, especially Kang Yatze and the wild peaks of the up to now hidden part of our massif. 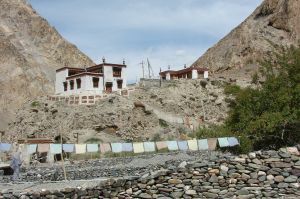 The good view has also a practical benefit for Rigzin: Up here, he has a cell phone connection and can call several friends. 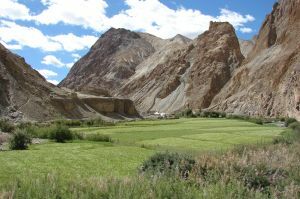 In Markha Valley there was no connection at all. For the descent, we find a better way without crevasses. 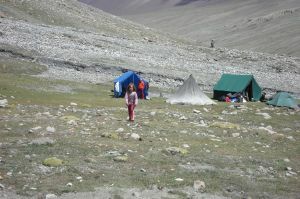 Back to basecamp at 1 pm (5 1/2 hours ascent, 2 hours descent). A rest day for Claudia and Hartmut, if this is the right word for the the entertainment program for Nina. Marion and Henning set off for Konga Ri and Shaldor Ri. 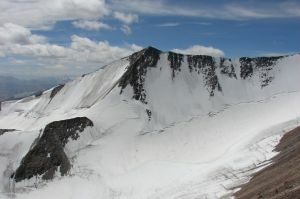 The snow slope on the right side of the crest turns out to be unfomfortably steep, so they do not proceed to the summit despite having the crampons. 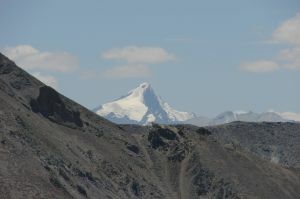 Anyway it is obvious that the summit is not 5780 m as indicated on the Olizane map but rather at least 5900 m high. 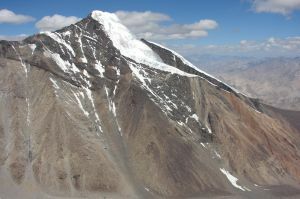 From the highest point reached (5870 m), maybe 80 height meters were missing to the summit. Way back via Konga Ri with its nice panoramic view. 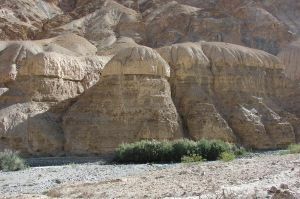 With the detour to Shaldor Ri, it is later than at Claudia's and Hartmut's trip two days ago, therefore the river crossing is a little more challenging. A special highlight of the day was viewing wolves close to basecamp in the early morning. Unlike for Regoni Mallai Ri, this time we leave as late as half past five - so we don't need to take the headlamp with us. 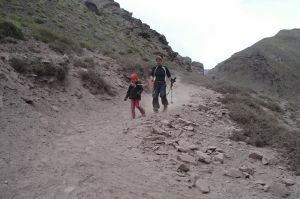 Rigzin leads us up a somewhat adventurous trail through a steep moraine valley. 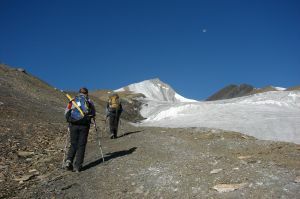 After the first 300 height meters it becomes better, a more or less good trail ascends through moraine hills south of a glacier1. 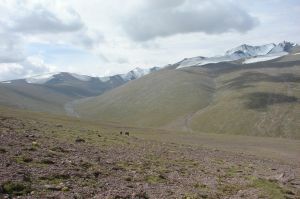 From 5800 m on, the trail leads through scree and debris a little left of Dzo Jongo east ridge. 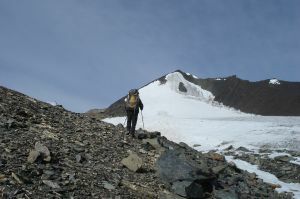 Apart from a flat and uncritical portion at the beginning, all snow fields can be avoided at their left side; crampons are not needed. The summit is time and again covered by developing cumulus clouds, but they seem to disappear as quickly as they came up. 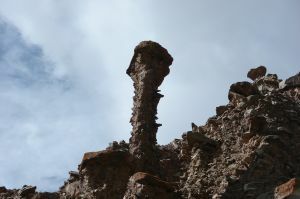 At 10:20 Uhr we reach the summit, the altitude (according to GPS) is 6214 m. Despite the clouds, the view is quite perfect, especially to the wild rock towers in the south. 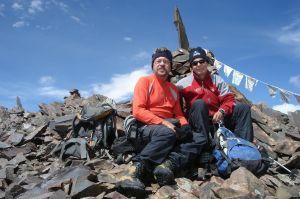 The continuation to the higher summit of Dzo Jongo West seems to long to us, it appears clearly more difficult than the ascent to the eastern summit. 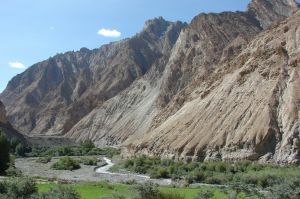 We cannot have a rest day tomorrow, since the depart towards the Indus valley is fixed in our schedule. After some rest we turn back towards the descent. 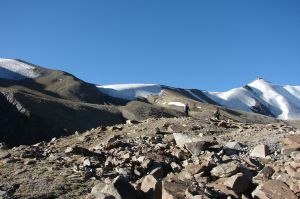 Forty meters below the summit we meet a group, lead by a German mountain guide. They had ascended a ridge further sourthward. They have a basecamp a little further outside the valley as seen from our basecamp; we could see it during our descent from Regoni Mallai Ri the day before yesterday. During the further descent, dark clouds come up, and we encounter some graupel (sleet) for half an hour. In basecamp it is more or less sunny again. 1 This is the glacier which originates in the triangular (NE)face of Dzo Jongo East, separating Dzo Jongo from Theny Ri trennt. It flows towards northeast. Having quite successfully spent the last four days at the surrounding mountains, this morning we leave our green but windy high valley again. The last two trekking days are to be done. From basecamp we can reach the trail to Konmaru La directly without traversing down to Nimaling. At the pass (5287 m) we are back on the "main road" - after the quietness in basecamp we have to get used again to see 30 to 40 people at a time. From Konmaru La we enjoy a nice view back to our mountains, Kang Yatze and the smooth hills of Nimaling. On the other side we find the contrast: Deep gorges, as far as we can see. 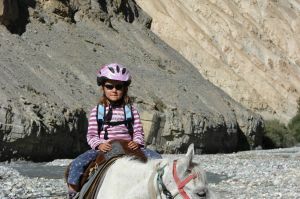 Nina cannot ride down here, the trail is too narrow and exposed. Rigzin takes her on his back in the child carrier. We can walk down the trail without problems in our sneakers, but with the heavy carrier that would be another topic. The way is winding down through a narrow gorge, changing the side of the valley, avoiding very narrow parts by some additional ascents. Time and again, new gorgeous views are opening, the trail doesn't get boring. 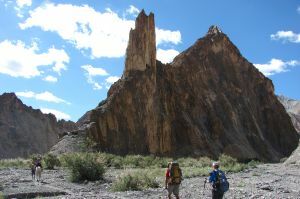 At 13:30 wa reach the campsite Choskyurmo (4140 m), today's destination. 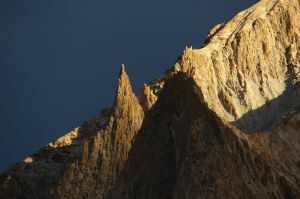 The weather is not as stable as a few days ago: At the pass it was cloudy, mostly it was sunny but in between a few short showers. At the campsite it is sunny again but windy. There was a little rain in the night; further up the slopes are a little whitened in the morning. The equipment which we decide to not take back to Europe is drawn to the expedition helpers in a lottery. After that we start for the last trekking day. Again we go through long gorges and valleys, almost uninhabitated meager landscape with only a few single houses. 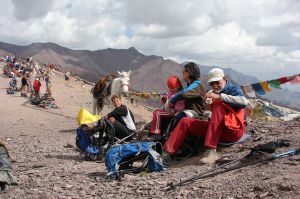 It takes only two hours, and we are in Shang Sumdo (3675 m) where we wait for our horses with the baggage and the cars. 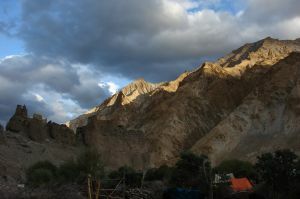 After an hour, everything has arrived - drive back to Leh. We enjoy the shower in the guesthouse; finally we get rid of all the dust that had accumulated everywhere through shoes and clothing. A little irritating is the change to the bustle and traffic chaos in the narrow roads, now having seen only mountains for almost two weeks. Rest day, we spend the day shopping for souvenirs, as far as we can get some. At lunch in the restaurant, the beer is served in a tea pot - probably the restaurant has no license for alcohol. 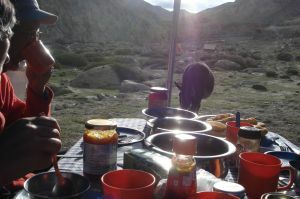 Dinner with our "followers":Karin and Uli, living in the same guesthouse, will be on their trip together with Rigzin. Transport to airport at 5 am; in the airport we have to pass a lot of security controly. But we have plenty of time, the flight is delayed by half an hour. From the plane, at perfect weather we look at mountains and mountains and mountans, in between mostly uninhabited valleys. 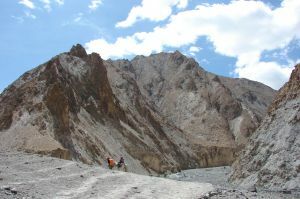 Alpinistically there would be so much to do, but the approach mostly would be much farther than our Markha Valley trek. In Delhi we are welcomed by the hot and humid monsoon again. Transfer into the guesthouse "Tree of Life" in a residential area in the south. There we spend the day in air condition, until we are brought to the airport for the night flight to Munich. For sightseeing it would be too hot and Delhi not really of very big touristic interest. We have a lot of time for the international flight, and this is good: The spare batteries have to be moved from the cabin baggage to the checked baggage at the security control. The flight is quiet and comfortable, we arrive in Munich on Tuesday morning at half past five.